I read Fangirl on a whim; I’d really enjoyed Eleanor & Park so I was pretty intrigued to see whether Fangirl would be as good. 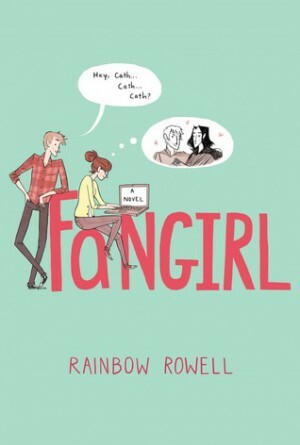 I still prefer Eleanor & Park, mostly because it deals with more serious issues, but Fangirl is, I think, a very cute novel that is so much fun to read. So Fangirl is basically about a pair of twin sisters who at first seem very different. Cath, our main character, is an introvert with a talent for writing; she is deeply involved with the Simon Snow fandom i.e. the book’s version of Harry Potter, and the novel is interspersed with sections of her own fanfiction. Wren, once as big a fan of Simon Snow as Cath, now enjoys going out, partying and flirting with boys. There’s also romance, within Cath’s real life and in her fanfiction, a love story about Simon i.e. Harry Potter and Baz i.e. Draco Malfoy, which is just the best tbh. Cath’s family also plays a big part in the story – her relationship with her twin sister Wren but also with their father adds more background to an otherwise sweet, light story. I have to say that the fanfiction aspect of this novel really drew me in. I loved it so much – the depiction of fandom is portrayed accurately without even a hint of judgement. Cath’s love of Simon Snow goes deeper than obsession – it’s a way for her to interact with her surroundings and it provides her with an escape from a world she sometimes finds difficult to live in. I think it was very clever for Rowell to make Cath a writer because writing is such a solitary task for so many people – it’s an escape, a way to explore the world and push boundaries that you wouldn’t necessarily be able to within the limits of real life and fanfiction is just an extension of that. I love fanfiction, you guys. I’ve been reading it pretty much since the day I realised it was a thing (God bless the day I found ff.net t b h) and Cath’s over the top, often ridiculous yet sweet and touching fanfiction feels true to what fic is actually like. And the fact that Cath writes slash fic? GLORIOUS. “Cath ran her fingers along the cover, over the raised gold type. Cath freed an arm to wrap around her sister. “I can’t believe it’s really over,” she whispered. Have you checked out An Archive of Our Own? They’re smaller than fanfiction.net, but I like their selection better. I haven’t read this book or Eleanor & Park yet! I’ve heard nothing but good things about both books, so I really need to get started on them. 🙂 Glad you enjoyed this one, even if not as much as Eleanor & Park. I’m excited to check them both out! This book sounds great! I’ve been hearing so many good things about this author, but her other work doesn’t sound like my type of thing, but I really want to give this one a try 😀 I think I’ll love that character development in Cath. I used to read and write fan fiction myself, so this is going to be fun! I had to buy the ebook of this recently because of the sheer amount or praise I was reading about it… I have very high expectations at this point! While for the most part I didn’t really like the fanfiction in this book (it felt so disconnected from the rest of the story), that passage at the end made me cry because OH MY GOD HARRY POTTER. I loooove that this book describes just what fandoms can do to people. I’ve read/written so much HP fanfic and just. Yes. I also prefer E&P, but this book is just wonderful.